Using the gas/oil separation plant system, it is possible to fully tap natural oil reserves. The more important the commodity, the greater the resource requirements are: oil forms the basis for numerous key industries around the world. Bilfinger has developed the powerful Gas Oil Separation Plant (GOSP) system so that oil and gas from natural deposits at depths of several hundred metres can be accessed and processed efficiently. In this way, experts in industrial plant technologies for the oil sector provide the knowhow that is required to split the fluid into three phases - oil, formation water and gas. As a result, even sources with a low proportion of oil can be tapped virtually free of any residue. Wherever oil is produced in the world, it is accompanied by substances of different compositions on its journey to the surface and must initially undergo three-phase separation before it can be processed. Working with selected partners, Bilfinger initially performs a process engineering analysis of the samples obtained in order to help the customer maximise the efficiency of its exploration activities at the reserve in question. The results of the analysis are used to develop the appropriate production strategy. Oil separation expertise also includes efforts to recover oil from water-rich reserves in which it accounts for only a proportion in the single-digit percentage range. When the system is designed, it is important to implement an efficient circulation system with the aim of extracting even the last drop of “black gold” from the production field and to push the purified formation water back into the deep horizon so that it can absorb more oil from the deposit again. 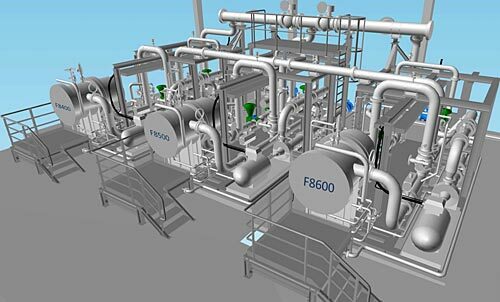 When implementing the GOSP system, plant designers frequently make use of the proven offshore hydrocyclone technology. This involves splitting the fluid containing oil and gas into various basic substances under the influence of high G forces. The art mastered by the engineers is to design the hydrocyclone vessel including the piping, valves, pumps and measuring and control systems and to assemble and deliver them on a modular basis. This is expertise that Bilfinger has amassed in many years of experience in plant and pipe engineering for the oil industry.